"These mushrooms are a combination of my favorite things. They are a hit among all crowds. There are never any left!" Preheat an oven to 350 degrees F (175 degrees C). Prepare a baking sheet with cooking spray. Heat the olive oil in a skillet over medium heat; cook the onions and mushroom stems in the hot oil until the onion is translucent, about 5 minutes; season with salt and pepper. Transfer the mixture to a large bowl; add the artichoke hearts, cream cheese, sour cream, Italian cheese blend, and Parmesan cheese. Season with salt, pepper, and garlic salt. Stir the mixture until ingredients are evenly distributed. Stuff the mushroom caps with the mixture. Arrange the stuffed mushrooms on the prepared baking sheet. Bake in the preheated oven until the filling begins to bubble, about 20 minutes. 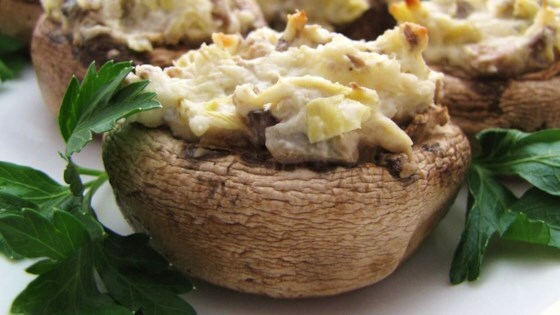 Enjoy baked mushroom caps stuffed with a delicious vegetarian filling. Nice balance of flavors but a little too creamy for my tastes. Maybe add a little less cream cheese and bake them longer. Also, I used minced fresh garlic rather than the garlic salt.